In the aftermath of Monday's additional tariff announcements, the most interest market response was how well financial markets - particularly equities and commodities, and to a lesser extent emerging markets - responded on both Tuesday and Wednesday to what was a clear escalation of the ongoing trade war. The explanation most frequently offered is that this was the result of overly pessimistic positioning and tariffs at the lower end of what was proposed. However, according to BofA much of it could also be a "clear the air" reaction to the passing of a risk event and the possibility of negotiations continuing despite the escalation. Is this a reasonable assumption? 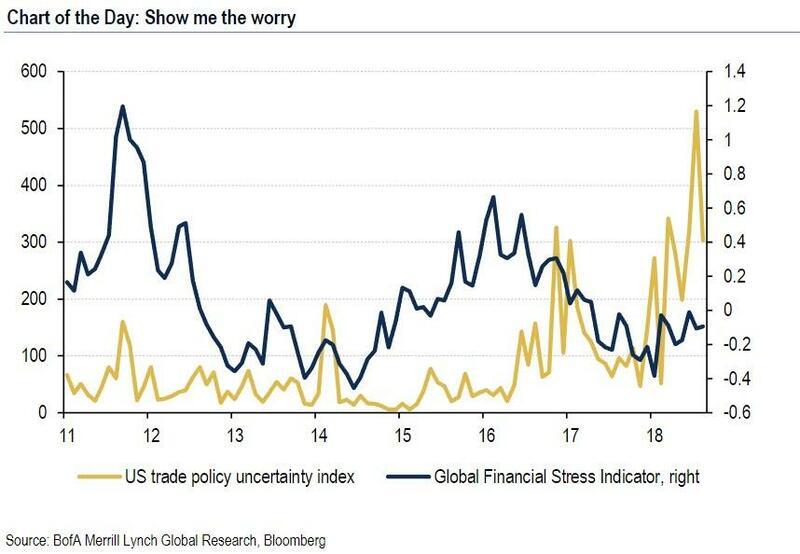 An analysis by BofA FX strategists argues that for FX markets, the much more important non-trade policy responses from both the US and China will be crucial. anticipation of policy responses, particularly on the monetary front, to soften any economic blow. Do the tariff announcements "clear the air"? To be sure, BofA notes that the risk-on response of the market suggests a "clear the air" interpretation of the latest tariffs, which were anyway at the lower end proposed levels. The announcements are perceived to have reduced the risk of further immediate tariffs as well as opening a period during which the US and China can negotiate. Looking ahead, the bank highlights two important flag posts to judge whether this assumption is reasonable. The US statement promised to "pursue" tariffs on an additional $267bn of Chinese imports if China took retaliatory action. To the extent that the mid-term elections matter for any further policy response, it will be important to see the direction of political polls over the coming weeks. An improvement in polling, coupled with the strength of the equity market, may embolden further action. However, if public perception of the escalation proves neutral-to-negative, it could focus minds toward reaching a deal. The most significant aspect of China's response was not to close the door to talks. The MOFCOM statement said the US tariff move brings "uncertainty" to consultation, while a press briefing did not definitively say whether talks would continue or not. With China already responding with retaliatory tariffs, a further drastic step of completely ruling out bilateral talks seems unlikely at this point. It will be important to see if Deputy Premier Liu He will go to Washington to meet with Treasury Secretary Mnuchin as scheduled on September 26-27. A key point here is that non-trade policy response more likely from China than the US. For FX markets, BofA claims that the non-trade policy reaction function matters beyond the political noise. The USD has weakened vs high beta FX, but is largely unchanged vs the EUR and CNH, while the US curve bear steepened in response to the tariff news. This is consistent with the broader risk-on response and the assumption that both the Fed and PBoC may shift to a more cautious policy bias. Here BofA highlights the following. In terms of the Fed response, the focus on the September meeting communication will intensify. Most economists expect little effect on the course of monetary policy for now, with a trade war being a risk scenario rather than a baseline for the Fed. Much will depend upon whether trade uncertainty leads to greater confidence spillovers but for now, all evidence suggests the Fed will continue on its projected path of tightening, limiting the downside for the US dollar. In contrast, outright easing is more likely in China, both on monetary and fiscal fronts. As the market response in China demonstrates, further credit loosening as well as infrastructure spending by Beijing is expected, in line with the recent sharp outperformance of infrastructure stocks (coupled with a little help from the "National Team"). In turn, more aggressive easing could support commodity exporters exposed to the domestic non-tradables sector, consistent with the outperformance of commodity currencies since the announcement of tariffs. In terms of the CNY, much would depend upon whether negotiations proceed; if they do, political sensitivity may lend more stability to the CFETS basket (specifically holding above 92), even if USDCNY moves somewhat higher alongside a broadly stronger US dollar. The bank has previously argued that G10 FX moves this year have largely divorced from local data outcomes, partly due to trade concerns. As Chart 1 shows, the AUD has been the weakest performer despite stronger data outcomes than most countries, while the EUR and JPY have strengthened despite the most negative run of data surprises. Any receding of trade worries due to negotiations could see some reversion toward fundamentals. The directional implication for the USD from this chart is limited given its outperformance has been consistent with stronger relative data. For EM FX, receding trade concerns are a necessary but by no means sufficient condition for EM currencies to rally. Apart from an improvement in idiosyncratic fundamentals, a moderation in the pace of Fed tightening and USD strength is viewed as critical. We believe the decomposition between real rates and inflation breakevens best reflects this factor. Chart 2 illustrates the close correlation of EM FX with the differential of US 5y real rates and 5y5y forward breakevens. The latter metric has moved higher recently, symptomatic of the Fed's intention to tighten policy despite trade uncertainty. In short, a sustainable appreciation of EM FX will require a reversal in short-term US real rates vs long-term breakevens, the bank's FX strategists conclude.